Chocolate and orange is a delicious combination. The orange adds a bit of freshness to a chocolate dessert that otherwise might seem a little too heavy. 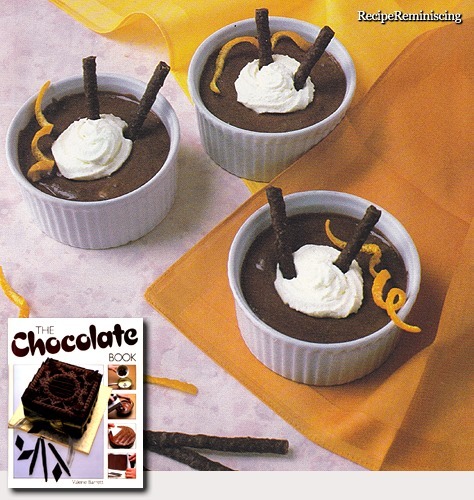 This entry was posted in 1980's recipes, Chocolate, Cream, Desserts, Eggs, Oranges, Recipe collections, Recipes and tagged Desserter, Dessertoppskrifter, Matblogger, Oppskriftblogger, oppskrifter med sjokolade, Sjokolade, Sjooladedesserter. This looks delicious! I have a dinner party coming up and will serve this as the dessert using just-harvested oranges from my back yard. Hmmm…that can be a good thing, until it is too much of a good thing, right? Tonight’s the night! I’ll be making this recipe today and am very excited about it. I hope mine is as beautiful as yours!